The Jeep Africa is supposed to be "the ultimate Jeep Wrangler for back-country and overland expeditions." It's a sloped-roof station wagon Wrangler with 35" tires and a 2.8 liter diesel engine so yeah, I'd say they pretty much nailed it. Reminds me of the home-built "Safari Caps" we featured a while ago, but with the polish of OEM construction. 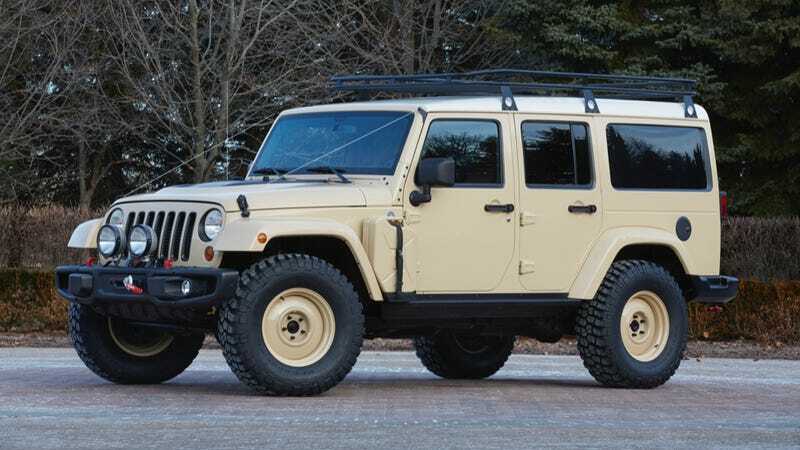 This Desert Tan Wrangler Unlimited features a high-clearance steel winch bumper, power rock rails (which will be very interesting to see in action), and a power dome vented hood. The body's extended a bit off a regular four-door Wrangler and the roof is not removable. Fox shocks, a 2" lift kit, sway bar links, and Dana 44 axles, limb risers, a full-length roof rack and a bedliner'd interior finish it out. This is one mean, clean, overlanding machine in one of my all-time favorite truck colors... I'm totally sittin' smitten over here. Did I mention it's diesel! ?